In the most basic sense, a sponsorship letter, also called as a sponsorship proposal, is a document commonly used by nonprofit organizations to request sponsorship or donations from businesses, groups, or individuals. Similarly, it can also be used to help support events or causes that organizations hold. 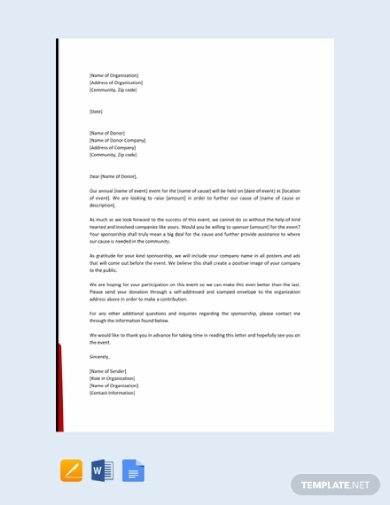 In this article, various templates and examples of sponsorship letters used for different purposes are provided. 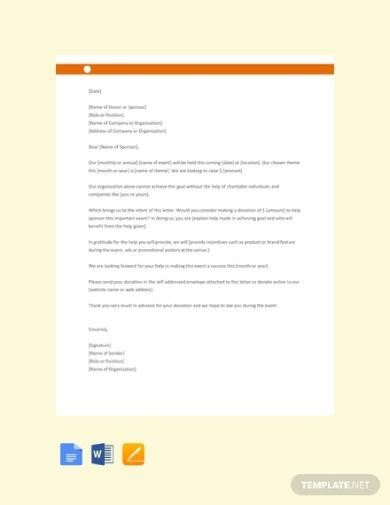 This sponsorship letter for donation template takes the standard sponsorship letter format. It provides all the details about the event that needs the donation along with the amount that needs to be raised. It clearly explains how the organization needs help in raising funds; thus, soliciting for any assistance. You can download this template for free from this article and provide the necessary information in place of the ones in the brackets. Nonprofit organizations heavily rely on donations and cash assistance in order to hold events that help an important cause. In relation to that, you need to write a good event sponsorship letter in order to encourage donors to give a generous donation to your case. Downloading this template will give you well-written content in a formal letter format that you can easily edit to incorporate all the relevant details. 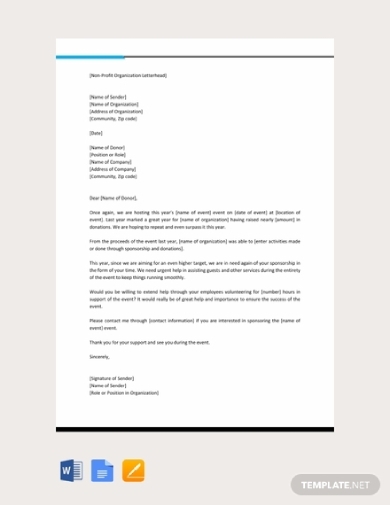 If you are looking for a sponsorship letter that will help your corporate company raise funds that will help a marginalized community, this template is perfect for you. You can easily edit this template to make sure accurate information is provided; you can also tweak the contents of this template should it be not what you prefer. This is can be edited in Google Docs, MS Word, and Apple Pages. When you want to hold an event to raise funds, you need to send professional letters to request donations from businesses, organizations, or individuals. The sponsorship letter you send should provide enough context about the event and a clear statement of what you need or ask from them. Luckily, you can immediately use this template to convey your message. Just download and edit the contents as necessary. In order for a sponsorship letter to be effective, it must contain accurate details about what the fundraiser is for, where the donations will be specifically used for, and so on in order to gain the trust of the potential donor. Therefore, it is important to know how to write a comprehensive sponsorship letter. 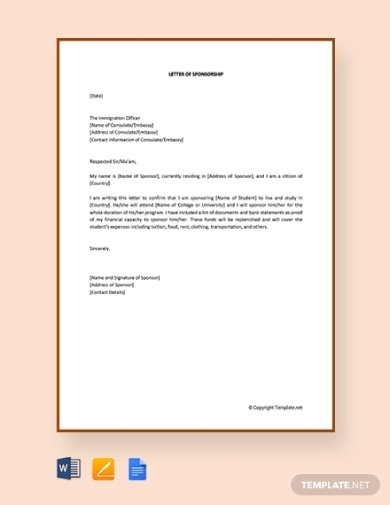 But if you want to get ahead, you can download this well-written and clearly formatted template to use as your base for the letter that you send. 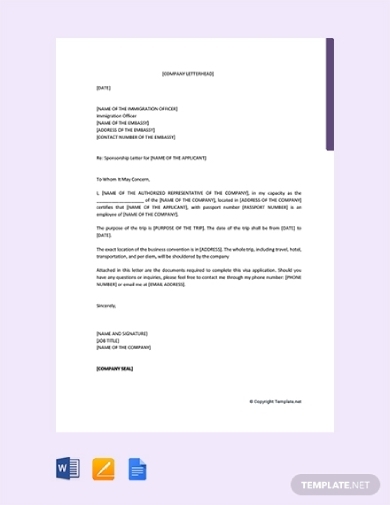 Contrary to the other sponsorship letter templates, this one is used as proof that you, as the donor, are responsible for the financial expenses of your recipient during his or her travel. 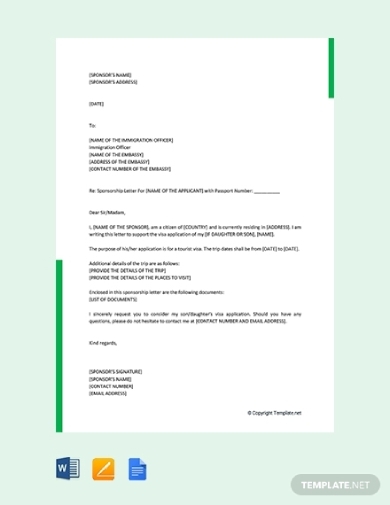 This type of sponsorship letter is commonly a required document for the visa application of the recipient. 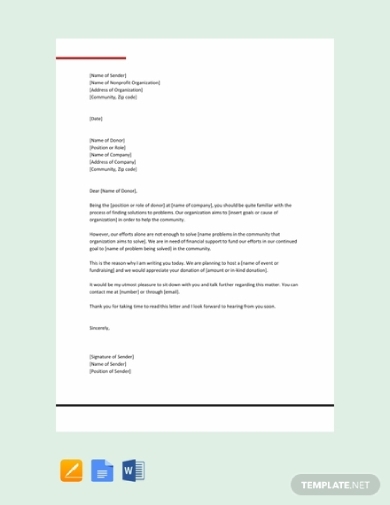 Downloading this letter template will help easily start the writing process to make an effective sponsorship letter. 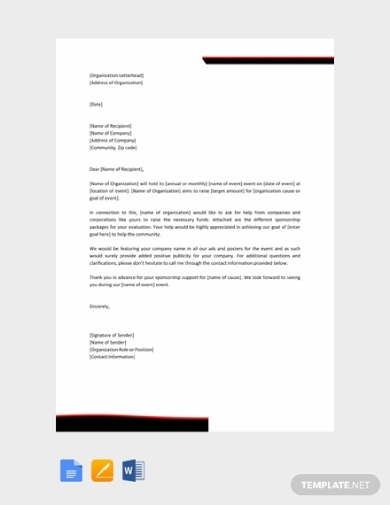 Looking for a simple yet clear sponsorship letter template that you can easily edit and use? This one is perfect for you. You can easily express your intentions with the clear format and well-structured sentences of this template. You can download this one for free and edit the contents as you see fit in Google Docs, MS Word, and Apple Pages. In case a dependent wants to travel to another country, a supporting document will be required during the visa application. In that case, you can show and certify your support through the use of a sponsorship letter. The letter will include all the details about your relationship with the recipient, information about the travel along with necessary supporting documents or statement templates. 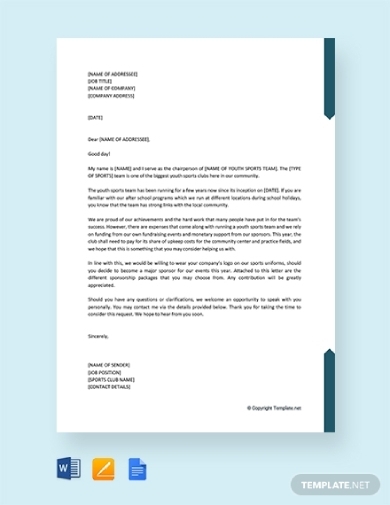 If you are in need of sponsorship letter for that purpose, you can download this template and easily edit its contents. 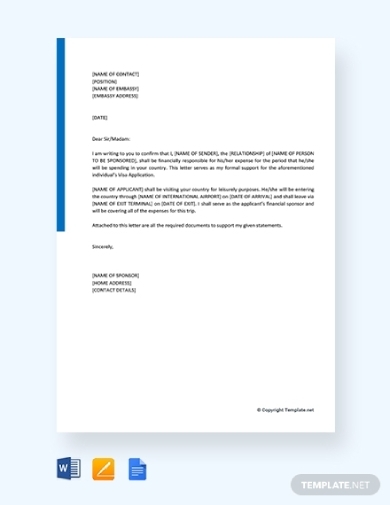 A sponsorship letter is a type of professional or business letter; thus, it is important to know how to write one in order to convey the message effectively. 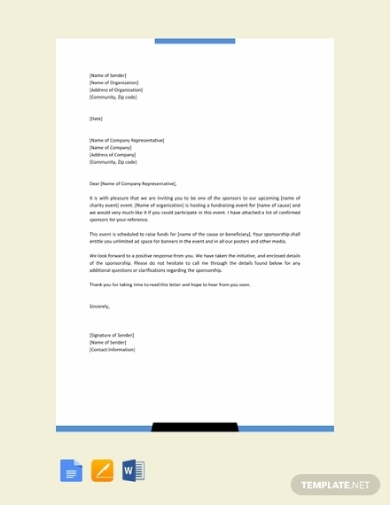 This editable template contains the basic elements of a letter such as the return and inside address, date, salutation, complete body paragraphs, complimentary close, and signature line. All that is left to do is edit it to provide the actual information relevant to its purpose. Aside from relatives, the company a person is currently employed in can also sponsor your visa application especially when it is for work-sanctioned travel. As the employer, you need to provide a sponsorship letter that will certify the legitimacy statement of you being the sponsor for the travel. Downloading this template will give you a well-written content that you can easily edit to incorporate actual accurate details. There is a need to divert the energy of the youth into good and productive activities like sports. However, youth organizations simply do not have the budget to hold events that can cater to a large number of people. In that sense, donations will be needed. To ask donations from businesses or individuals, you can use this youth sports sponsorship letter template to use for this specific purpose. Download this template from this article for free. Some students opt to study abroad in order to widen their knowledge and perspective. There are also instances where the university the student is enrolled in will encourage students to join exchange student programs abroad. In these instances, the university or any scholar sponsor will have to prove that he or she is in charge of the expenses on the student while on location. 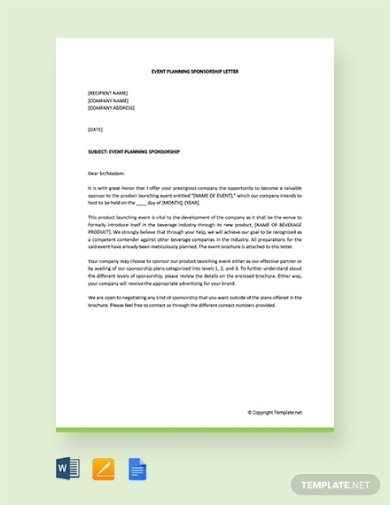 You can download this sponsorship letter template to easily provide the needed details. Aside from including details about the event you are planning, it is also important to include what benefits that donor will acquire when he or she donates for the cause. 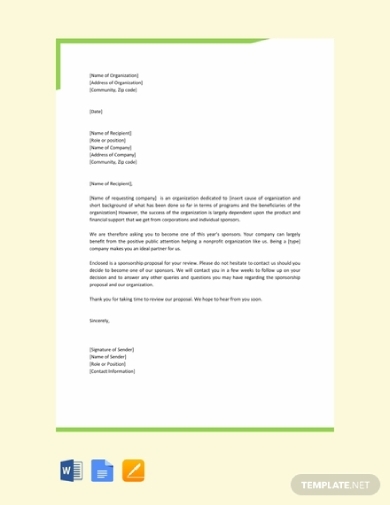 To clearly explain all those important and relevant details, you can download and use this event planning sponsorship letter template, all you need to do is provide the actual details relating to the event. 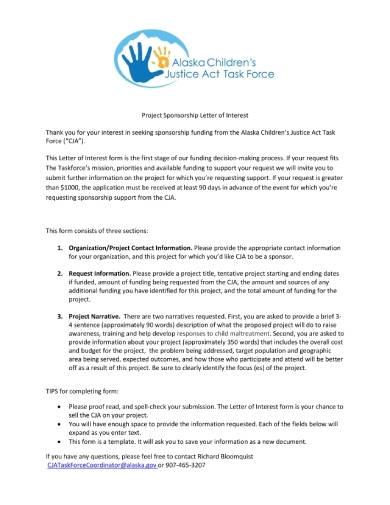 This sponsorship letter is given to recipients that take an interest is asking sponsorship from an organization. This is given to the recipient in response to their initial sponsorship letter or request letter. This put into details the requirements the recipient has to comply in order to secure a donation for the project that they have initially endorsed. 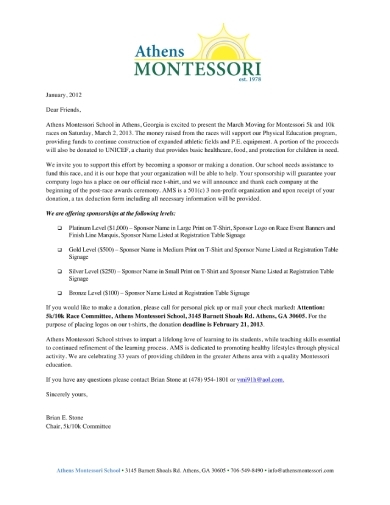 If you examine this sponsorship letter, it has provided complete details about the upcoming race the school will hold. More than that, it has also provided enough details about what the sponsor will get in return for his or her generous donation. You can use this letter example as the basis or guide when you want to make your own sponsorship letter.